Our Yelloh! Village Parc de la Côte Sauvage has an exceptional location and is one of the most beautiful campsites in La Palmyre. It was built on the edge of La Coubre forest in the natural, unspoiled environment of the Gironde estuary at the foot of the famous La Coubre lighthouse. It has direct access to the beach as well as to the Bonne Anse Bay. 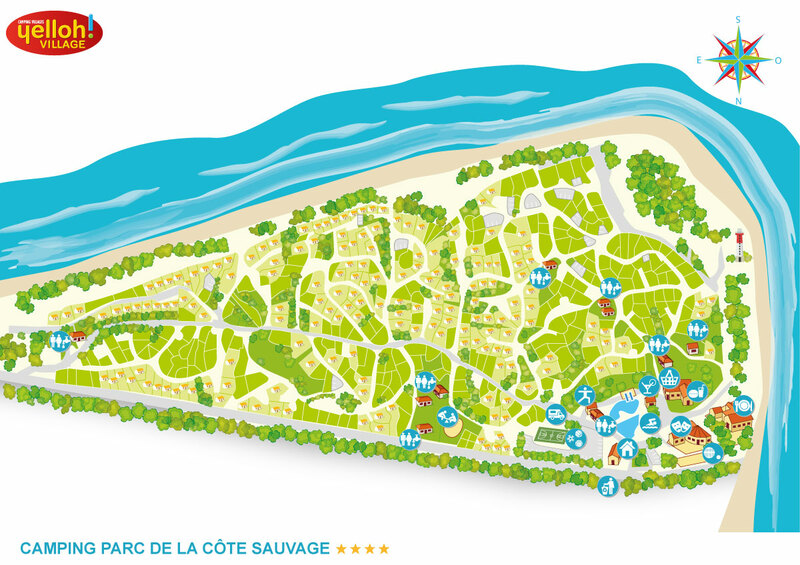 The Parc de la Côte Sauvage camping is proud to welcome you to this idyllic spot and to offer you high-end services. Everything is designed to make your camping holiday in La Palmyre easier! A special location in the heart of the national forest of la Coubre la Tremblade. A waterside campsite with fine sand beaches and the Atlantic Ocean just a few metres away. A 500m² aquatic park with heated indoor swimming pool, waterslides, lazy river and bubble seating. L’Auberge de la Côte Sauvage restaurant invites you to enjoy a pleasant family-friendly atmosphere. A range of entertainment options for the whole family: kids' clubs, sports tournaments, watersports, special evenings etc. Wonderful pool, beautiful cottage and location. La Palmyre is a very popular seaside holiday resort with long beaches of fine sand and a sunny, mild ocean climate. You can explore all of the city's treasures when you stay with us at the Parc de la Côte Sauvage campsite. Paved bike trails depart from the camping through the forest to La Palmyre's marina or zoo in just a few minutes. The most adventuresome can head for the magnificent islands of Aix and Oléron (may be reached by car) to discover the beautiful island landscapes. Did you know that France's most famous fort is only a few kilometres from the island? Fort Boyard is visible from the north of Oléron and you can get a closer look during a boat excursion. Finally, the Côte Sauvage (Unspoiled Coast) is well-named with its kilometres of beaches; those on the Bonne Anse Bay are protected by a dike, while the beach at La Courbe lighthouse opens on to the Atlantic ocean. Your stay at La Palmyre campsite will be filled with visits, swimming and lazing, making it an unforgettable, relaxing holiday.